Gold has posted sharp losses in Thursday trading, after posting gains on Wednesday. In the North American session, the spot price for one ounce of gold is $1295.06, down 1.10% on the day. It is a light day on the fundamentals front. Unemployment claims climbed to 229 thousand, above the estimate of 225 thousand. On Friday, the U.S. publishes the Empire State Manufacturing Index and UoM Consumer Sentiment. The crisis around Brexit has reached a fever pitch this week, with the British parliament set to vote on Brexit for a third straight day. On Tuesday, lawmakers narrowly voted to remove the option of a no-deal Brexit. This vote is not binding on the government, but it’s clear that most MPs do not want a hard Brexit, in which Britain crashes out of the European Union without any agreement. Next stop on the parliamentary train is a vote on Thursday to extend Article 50, the mechanism of the Brexit withdrawal. Britain is currently scheduled to leave the E.U. on March 29. However, even if Article 50 is extended, the uncertainty will continue, and we can expect additional parliamentary votes next week. On the European side, all 27 members of the E.U. have to agree to an extension. It’s not clear how long an extension would last. Senior European officials have said that the extension could be a year or longer, but Prime Minister May would likely prefer a much shorter hiatus. There is also talk of a second referendum on Brexit, underscoring the political chaos which has gripped Britain. With the U.S-China trade war showing signs of easing, there were expectations that President Trump and Chinese President Xi might hold a summit in late March. However, it was reported on Wednesday that the two leaders will not meet before April. This has raised concerns that the sides have not managed to resolve their differences. Trump has said that he is not in a rush to reach an agreement, but a deal with China would be a huge victory for Trump ahead of the U.S. election in 2020. 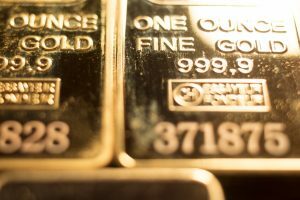 Despite market disappointment over the delay in a Trump-Xi meeting, gold has been unable to take advantage, as the metal is sharply lower on Thursday. 1284 is under strong pressure in support. Previous Previous post: How Does Kopi Auntie and Uncle Make Money? How Much Can They Make?